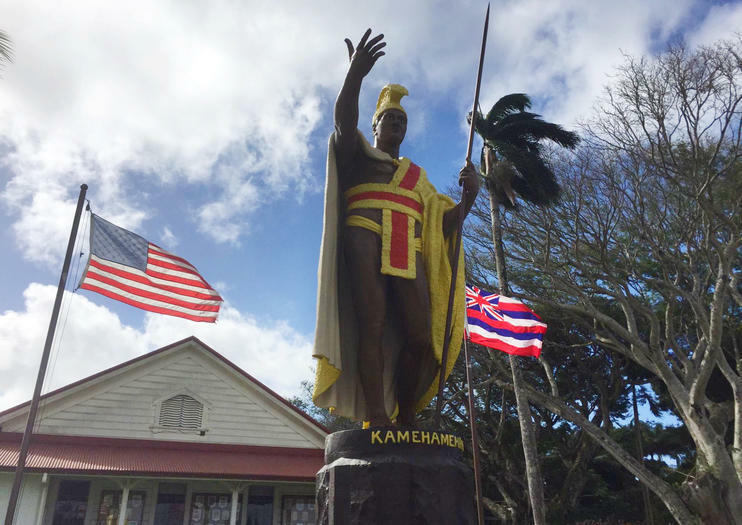 A nine-foot-tall golden-helmeted and spear-wielding bronze depiction of King Kamehameha the Great stands on the North Kohala Civic Center lawn in the tiny town of Kapaau. Though there are similar statues honoring the King throughout the state—including notably in Hilo and fronting the State Supreme Court in Honolulu—this site is perhaps the most significant to the king’s own story: He was born not far from here in 1758, and lived his first few years in hiding deep within a nearby valley where he was safe from battling tribal factions. Kamehameha would later prove his strength, acquiring each of the Islands for the Kingdom of Hawaii by 1810. The statue, originally intended for a site in Honolulu and constructed in Europe, took several years to make. However, the ship transporting it to Hawaii wrecked in a storm near the Falkland Islands and the heavy sculpture sank to the bottom of the sea. Insurance money was used to quickly replace the missing statue with an even taller one, and that arrived in Honolulu in 1883 where it still stands today. Meanwhile, entrepreneurial fishermen lifted the original and sold it back to the Kingdom of Hawaii for a bargain price. Seeking a spot for the ill-fated statue, the state decided to place the original commissioned bronze here. Each June 11th—the state holiday honoring Kamehameha—all statues of the King, including this one, are draped in community-strung floral lei to celebrate his legacy. It’s hard to miss the King Kamehameha statue when driving through Kapaau along Akoni Pule Highway. After the town of Hawi, it’s on your right when driving east along the main drag through the northern tip of the Island. A small lot behind the Civic Center has metered parking. The cleverly named King’s View Café across the street (stop in for sandwiches, pizza or ice cream) will point you in the right direction if you happen to be looking the wrong way.